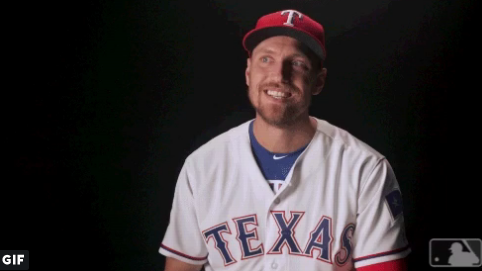 Home » Texas Rangers » Nothing to see. Former Twin Danny Santana, a .256 career hitter with 13 HRs and 100 RBIs in five seasons. Wet, cold, nasty, dreary, washed away. No, that’s not the forecast for the Rangers 2019 season. It was just last night’s weather in Arlington and it rained out the Texas Rangers game against the Oakland Athletics. It would have been the Texas debut of second baseman Danny Santana, who was called up to take the place of Rougned Odor, who suffered a mysterious knee injury stretching in the clubhouse before Friday night’s game. 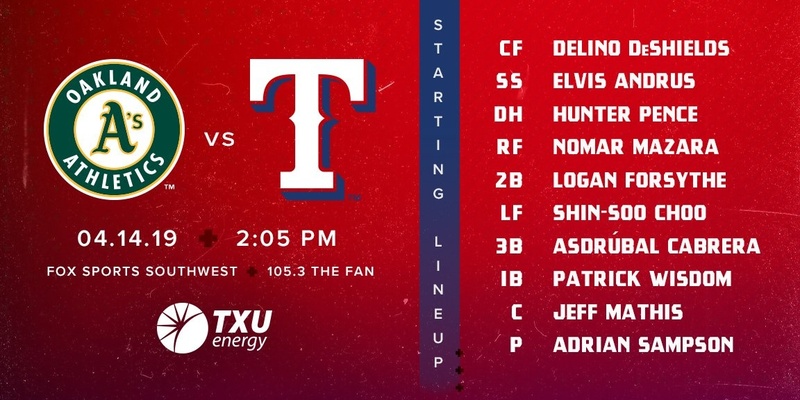 Santana was called up because the Rangers regular backup second baseman, Logan Forsythe, is now playing first because their regular first baseman, Ronald Guzman, pulled a hamstring and is out, and because the Rangers didn’t have a true backup first baseman. The team is roster-constructionally challenged. The twenty-eight-year-old Santana came up as an outfielder in with the Twins in 2014. He had a pretty good rookie season, finishing seventh in American League Rookie of the Year voting on the strength of batting .319 with an OPS of .824. Since then, he hasn’t been able to find much consistency. After bottoming out early in 2017, Minnesota traded him to Atlanta. In parts of the last two seasons as a Brave, Santana hit .199 in 171 at-bats, with three home runs, scattered over 84 games. Think of him as a right-handed Joey Gallo without power. He strikes out a awful lot, especially for someone without much thump. But he’s versatile defensively, logging major league hours in all three outfield positions, as well as second, third and short. Odor is expected to be out for a while. He won’t even be evaluated for two more weeks, so Santana should get a lot of playing time. Welcome, Danny Santana. More exciting than rain. After reading your post, “Sunday night…,” I realized I just carried over what I had yesterday. Today’s game is at 2:05. I just changed it. Heck, I have trouble keeping track of the month. Sunday’s are no problem because I have to hold services in the morning, so that keeps me straight on Sundays. For all other times, my brain doesn’t function. Kevin’s piece a few days back on Tanking got me curious about the expenses of operating a team. We know one side of the ledger says the team is “worth” approx. 1.8 Billion. I was curious about the other side of the ledger. What does it cost to operate the team. I got my trusty HP35s, a pencil, some paper, and figured I’d spend a half hour or so with google and come up with an answer. Wrong again Ed. Turns out the costs are enormous, and extremely complicated. Player salaries for the major and minor league teams are only a small part. There are the salaries of all the staff members of each club, plus stadium personnel (I could not find any real figures for those). Then there’s the employers half of SS tax for each player and employee, roughly 6% of the first 130K. There’s medical insurance on each player plus 75 percent of the insurance cost per dependent and a 50K life policy (once again, no figures) . Each minor league player gets $25/day per diem on road trips, I’ll get to the majors later. Roughly 150 Million in signing bonuses per year. Cost of servicing approx 1.4 Billion in debt; 800 Mil for initial purchase of the team and 600 Mil for the new stadium. Cost of maintaining the year around operation of the Surprise and Dominican complexes. The minor league complexes are owned by other entities. What the financial arrangements are with them I couldn’t find but assume the Rangers must pay a rental fee of some sort. Stadium operation plus property taxes on all complexes that are team owned. Surprise is split with the Royals. ML travel expenses are extremely complicated and I gave up. It’s all in the collective bargaining agreement, all 28 articles, 56 attachments, and 3 appendices. It comes to roughly $1300/wk/player during ST. $102/day/player per diem for every day of travel away from Arlington. Plus if requred to travel indepently guaranteed 1st class seating and meals if over 200 miles travel distance. And that’s about where I lost my mind. Oh yeah, to get out from under paying taxes on the parking lot they ceded the whole shooting match to the city of Arlington. So whatever the parking fee is, is Arlingtons, not the ball clubs. What the arrangements are with the concessionaires are I don’t know either. If you can make head or tails out of all that, good on ya’ because I can’t. Thanks, but I found that about 5 minutes in. I kind of included it in a block statement. In the grand scheme of things it’s almost irrelevant. Just the signing bonuses come out to almost as much. I loved playing that game, played just about daily since I moved to Texas about 26 years ago up until I blew out both rotator cuffs. Never could stand to watch it on TV. Played twice a week before that. Torrey Pines was one stop light and a right turn from our office. Used to take off about 2:30 to catch 3:00 happy hour. Less than ten bucks for a SDiego resident. This area is a good area if you like to play, because it’s EXTREMELY reasonable, you can buy an annual pass for, today about $600. When I first move here it was less that $300. The military has two courses with reasonable green fees as do the neighboring cities. Green fees and a cart will run you about $25. I was in good with the local pro, I used to do his club work, so he’d call ahead and fix me up so I’d get to play for free. Loved playing for about 50 yrs since a teen but had to give it up about 5 yrs ago. Just too tough on my discs though still go out and hit a few at the driving range for fun now and then. Just can’t swing full force anymore for 9 holes let alone 18. Double boggie. Tiger in 3 way tie now. Day’s got zero chance with only a couple holes left. My guy Koepka blew several opportunities and now very little shot at it. LOL, “roster-constructionally challenged”? Because… yeah. Tommy John bites again. Mason Englert Rangers 3rd round 2018 had TJ Friday. Sheesh!!! I was hoping for a good game with Down East today, Alas, bottom of the 3rd and the Woodies have scored four and still batting. Message to Anderson Tejeda and Leody Taveris ….. Careful guys. You keep hitting like you’ve been hitting you may wake up from your sleep and find yourselves in Frisco. They’re raking. Especially Tejeda. He went 3 for 3 yesterday off a lefty and hit two HR’s today off a righty. Sounds like time for a move up the ladder. I have yet to find a picture of Pence with a frown on is face. Wonder why the Rangers Pregame guys always have to have mics in their hands instead of lavaliere or clip ons so the big mic doesn’t always have to be in front of their mouths? Or maybe that is the reason. Good question. You’d think they’d do that. There’s Raymond and Nit….. doing the same. Maybe the Rangers can’t afford advanced technology. Well, he kept K. Davis in the ball park. bottom of the 1st Taylor Hearn goes 1,2,3 with two strike outs. Okay, let’s take advantage of this. Did that ball hit him? Wow. What a smart play. Can somebody say Elvis is fantastic? Do you know I have his jersey? In the first inning he threw two curves that I remember seeing. One was double filthy and the other was just so, so, if that. Just not consistent at all. Ump has a wide strike zone. They showed a slide in the pregame and including last year he has the widest strike zone of all umpires. I was wondering how long it would take Emilly to find that kid with the blue hair. His mom and Delino were tweeting back and forth. No, Taylor Hearn is not ready. He loaded the bases, then walked in a run in the bottom of the 2nd. Maybe I need to reconsider, he’s struck out 6 in 3 innings. The Woodies won their game eight to zip. Nashville loaded the bases and couldn’t score. Still losing 1-0. My faith in Sampson is not being rewarded. What’s worse Chavez is warming up. Good Grief! Sampson doesn’t have the repertoire to go far as a starter so far. He’d do better if he’d stop missing his spots. Since I’ve missed all but a couple early games my question is: Is Sampson a batting practice pitcher? ‘Cause he looks like one. He’s what qualifies as a depth piece in JD’s world. My 1st look at him he needs to be deep sixed rather than be a ‘depth piece’. Today he’s a depth charge that just blew up. Batting practice pitchers have to throw the ball to a spot. Sampson doesn’t have a clue where the ball is going. I’m really disappointed in Sampson. He had pitched decently before today. Not great, but decently. Today is the first time anybody had gotten a hit off his new slider. I’m going to quit making baseball predictions. I’m lousy at it. Well of course you follow up a guy who gave up 7 runs, 8 hits and 2 walks with Jesse Chavez. Do we have to play with K. Davis? It ain’t fair. Watched Tiger do what I did not think he’d do. I am happy for him. An elite golfer again? Yes. And the leader lost his. How did A’s score 4? I don’t know. I needed to set up the pressure cooker and get a beer. Came back and it had happened. Along with being lousy at prediction baseball I’m also lousy at paying attention. What we can say with certainty is they scored early and often. It all happened so quickly I can’t remember the exact events. But it wasn’t pretty. To follow up on your poker comments yesterday: Yes it’s lots easier to win at poker when playing with a bunch of rich, often drunk, and not too card smart college boys. My college dates appreciated those guys’ largess for several years as the foot tall German stein sitting on my chest of drawers was nearly always full of nickels, dimes, quarters and some dollar bills to pay for the dances, movies, and concerts at little Miami Univ, Oxford Ohio. So has Odor been hurt all along…or did it just happen? He was doing nothing at the plate. Does anyone know? I was sondering the same thing. I’d read that they had identified a problem with his leg kick causing him to miss fast balls in the zone. Then this, so in my mind it kind of fits. Well, in a way it may be good news. We know what he can do…and he was not doing it at all. “They said” he was stretching before the game and wrenched his knee. While possible, it’s also possible they just want him out of the lineup and working on getting his stuff together. OR he was already hurt and nobody realized it wasn’t just early season stiffness. Yes, you can never tell what the real story is. It could be any one of the three. In the end it doesn’t matter. Whatever the reason he’s on the DL. https://uploads.disquscdn.com/images/0a5fd7db309700be93e5fb6c93cb036a850e78ac9cba5c81dcc51f932f7b0c65.png I refuse to buckle to the pc crowd disabled is not a bad word. It says so right on my license plates. I don’t mind the term at all. Here’s my creditials: See right there disabled! They need to quit all the pc junk already. Well seriously, I actually think the move to IR is out of respect for those who are truly disabled and an acknowledgment that people who are temporarily hurt playing baseball are not truly worthy of the term. If anything it was done as a complement to and in consideration of disabled people not to hijack that term for use in describing a temporary injury suffered playing a game. The players are injured. They’re not disabled. Yeah, I get it, kind of, but I’m always sceptical of folks motives when they do stuff like that. Another one that raises my doubts is all the “we support our veterans” signs on businesses. Lowe’s and Home Depot don’t have signs, they just give you a discount. I guess for civilians that are disabled it’s not a bad deal. they didn’t sign up for it. Military folks not so much. We knew what we signed up for and get more than compensated. I’m probably off base, but so be it. No, I don’t think you’re off base with thinking disability needs to be respected. But as a writer, I appreciate that words do mean something specific. And sometimes we get careless with our language and terminology. The disabled are and should be a protected class of citizens, especially military veterans but really everyone disabled regardless of the cause of their disability. And the term should be reserved for describing a permanence of condition. Injury is something you heal from. Disability isn’t the same. Prince Fielder is disabled now. Odor is just injured. At least Hearn settled down. After walking in the run in the 2nd he was clean through 4 when he hit his pitch limit and was pulled only giving up the single run. I forgot to mention this, Hickory was rained out. Tell me I didn’t see Chavez pitch a scoreless inning. He did not. You were hallucinating. Who is this Gomez guy? Can’t possibly be a Rangers reliever. Wisdom looks pretty good at 1B. His foot is like glue on that base. And he looks like Bryce Harper. Do u know I have his jersey? I’m glad you are safely home! Thanks! It was a very nice and relaxing trip unlike our usual active, active, active tours. The one in June to Italy’s Lake Country will be much more active. And I won’t gain 4 lbs as I did on this one gorging on unlimited and always available Butter Pecan ice cream. Maybe one of these days I will make it to Italy. Have you been there before for leisure? Many times but not to the Lake Country up north. Sienna is probably my favorite place anywhere and in the off season Florence ain’t far behind. I love me some butter pecan. When I was stationed in Japan, before going in for the mid-watch (mid-night to eight am), I’d stop and get a bucket of Baskin-Robbins butter pecan. In relation to the one they get the scoops for serving cones, they had one half that size. That’s the one I’d get. I’d take it in for myself and the troops/sailors to enjoy on the mid. Troops because we had Marine Guards at the door. Yes we only had one door and no windows. We lived large on the mid watch. Even had a whole turkey on Thanksgiving and spiked coffee on New Years. I think they are in very real danger of pricing themselves out of the market. I haven’t shopped there in over twenty years. Just too expensive for what you get. Darn! I go to get a beer and they play Baby Shark. My favorite (does that word end in e?) song. I’m good at following directions, so thanks I’ll do that. I disabled (I mean injured!!) my spell check so I don’t know if it ends in ‘e’ … but I believe so. I’ll say it again. Mazara is slow. 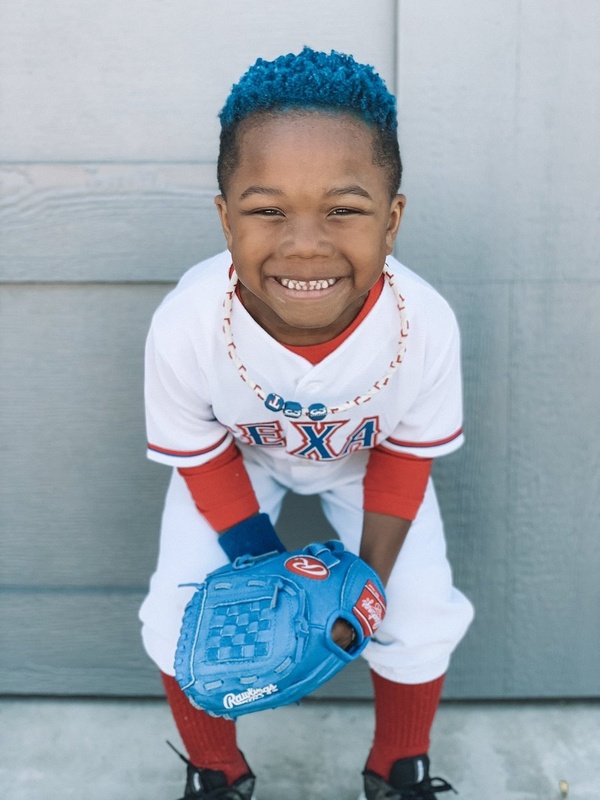 If everything goes the way I think it’s planned, and it may not, Mazara only has maybe 2 or 3 years left before he gets traded and the new outfield of JPM, Bubba and Leody take over. He’ll be a free agent by then. Either way, he’ll be gone. OK Cabrera you’ve been slumping. Time for a dinger to tie it! Do they have another comeback in them. Outstanding 1st hit for Santana as a Ranger. Santana has been doing real well in Nash. Hitting .350+. This is a great comeback. We’re fixin to find out if LeClerc got things sorted out on the off day. Seriously DD. You were already in scoring position so why take the chance? You were out by a mile. Elvis will probably give him an earful. He did not look happy. Not much. He was pretty scared. He basically parroted Emily. They really have him dressed from head to toe don’t they? This picture was from way before the game, More than likely at home. Till over the top cute. Come on Leclerc, you can do this! Only one more to go. The Oakland version of Kyle Seager! Yep, he has that habit of looking beatable most of the time. But just when you think you have him beat, boom comes the homer to be a dagger. 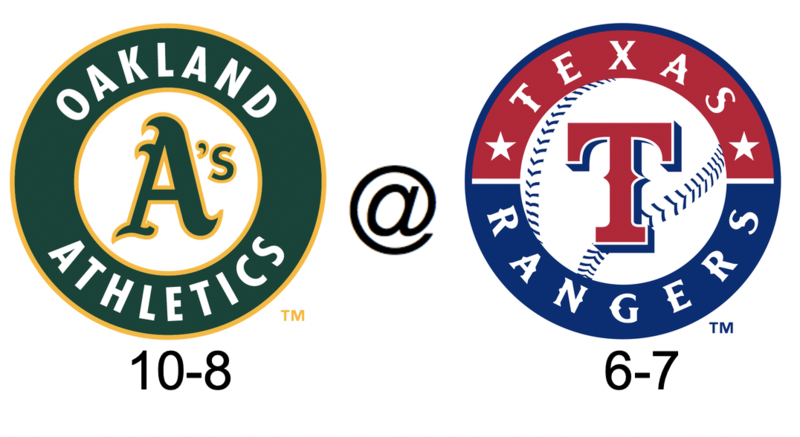 Great comeback and a great win for the Rangers against the #%^*ing A’s. That was awesome! Good job Jose! 5 scoreless from the Pen. And Chavez was one of them. Well . . . back to .500, Angels tomorrow. Be nice to take the series from them. No reason not to, as long as the Rangers are ahead before BP time. The Angels have a decent pen. Delino gets the Gatorade shower this afternoon! Both Delino and Danny Santana get game balls for their roles in driving the Rangers offense during the late innings against the A’s this afternoon! Elvis 🕺 was the spark in this game. Once again, the AL West is the only division right now where every team is at least .500 or above! The West has been really tough on the East and Central. The Rangers need to get some of that. Delino’s also making a young fan’s day by taking him into the team’s clubhouse! Cool! His mom, Emilly and DeLino had a pretty good run up to this on Twitter, DeLino never mentioned any club house stuff though. Great to see. The kid is going to treasure this for life. They had to move the tee times earlier than expected on Sunday because of the threat of heavy rain and thunderstorms around the Atlanta area. Hence it was the big reason Sunday morning CBS morning programming was preempted. I hope Trout doesn’t play in this series either per the Rangers announcers! He doesn’t it will be huge, if for no other reason than psychologically. I don’t understand why they signed him. Mathis was a joke at the plate when he was with the Angels, and he still is! We may as well not even have DH, and just let the pitcher’s hit as to have him in the lineup. Good grief! I never understood why RC was let go; but honestly, if Mathis is coaching IKF, he is doing a great job. Had to leave. Glad we came back and won! Time for Game of Thrones!!!!!!!!!!!!!! Squeeze bunt by DeShields with 2 outs. What a gutsy call by Woody. That’s the baseball I want to see this team playing. That’s the baseball that will bring fans to the park. Gallo had Andrus at 3rd the other night with no outs against a defensive shift. Memories of Billy Martin baseball. Per usual, it boils down to pitching, with each and every game, having different situations……….